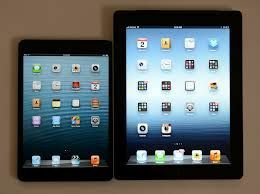 The thin, lean and 'mean' iPad Mini weighing just 312 grams has many believe forced the bulkier fourth generation iPad weighing 652 grams into obscurity. Analysts call it featherweight knocking out the heavyweight - and they are not wrong in saying so. No one would want to put a piece of heavy metal in one's pocket or even hold it for long in one's hand. Apple's iPad Mini is the first iPad to get Apple's A6 chip - in this case a turbocharged version called the A6X. The front-facing FaceTime camera has been upgraded to HD 720p video. The 4G/LTE iPad also works with a wider range of international carriers.